• Sunday, October 10 1:27 a.m. In an apt symbolic indictment of “Bicycle Friendly” Arcata, a car mowed down the BIKE LANE sign in the 1900 block of H Street. 2 a.m. Brew-ensloshed youths in the 1200 block of Ninth Street looked down at their hands and found them gripping beer bottles. They may not have remembered much about these objects’ origins, but the beery boyos did realize their immediate utility as missiles. Soon bottles arced across the night sky, mingling with baboon-like grunts and howls rising over a parking lot. A police car dispersed the hooting hellions. 3:35 a.m. Extremely noisy guests in a Plaza hotel room weren’t amenable to courteous requests to quieten down, not even when repeated four times. Evicted. 12:11 p.m. A man was found deceased in his I Street home. 1:02 p.m. A check was stolen from a Golf Course Road mailbox and cashed. 5:23 p.m. Two men sat in bushes on 12th Street, conversing loudly about beating someone up. 8:53 p.m. After a thorough booze beguzzling, a man curled up for a nap on the sidewalk near an historic Plaza storehouse. Police found and arrested the drunk-defuncted foetus. • Tuesday, October 12 11:15 a.m. Men argued at 13th and O streets, one consummating an important point by flinging a cell phone with force sufficient to shatter a car window. 12:26 p.m. A school superintendent reported an eight-year-old student missing three of the last seven days of school, and being late on the other two. The family, including a two- or three-year-old sister, was lodged in a Valley West motel, with the parents reportedly involved in meth-related activity. When the family was contacted, the parents said they didn’t have money for gas but that one way or another, the child would be in school the next day. 1:01 p.m. A school reported two of its coaches at odds, threatening each other and even fighting. 1:25 p.m. A gaggle of unkempt and not-so-subtle marijuana salesslackers roved the Plaza’s east side, aggressively approaching passersby regarding possible budnuggetry purchases. The alpha of the crew, clad in sleeveless shirt and ponytail, lingered under a tree, easing identification and arrest. 3:59 p.m. Three people walking unleashed dogs on Beverly Drive introduced unhelpful chaos into the complex and always tense social hierarchy among that street’s canines. A police visit ended with the dogs on leashes. 4:33 p.m. A family said to have washed out of a transitional housing program took up residence in a U-Haul trailer on Valley East Boulevard. Nearby apartment tenants complained of family members asking to use their bathrooms and even to watch their TVs. • Wednesday, October 13 1:35 a.m. Another dumpster fire at Seventh and F streets. 7:29 a.m. A Samoa Boulevard apartment dweller complained of a neighbor continually tapping on their common walls and verbally abusing him. 3:53 p.m. A marijuana plant was observed growing on the roof of an A Street residence. 5:42 p.m. A Hallen Drive resident didn’t speak English, but was able to convey that something had happened the previous day and that she didn’t want to die because of some “nasty person.” She claimed to have heard noises coming from her attic and wall. An officer replaced a cover over a hole which had been cut in the ceiling by a repairman. 5:51 p.m. Kids threw apples at a house in Van Dyke Court. 7:37 p.m. A man at a Valley West motel was evasive, but said he had been assaulted and had metal in his face. He then demanded an ambulance. • Saturday, October 16 10:02 a.m. After a hearty bout of yelling, a man retreated to his lair in the bushes on the south side of the phone company building on G Street. There was some disagreement among witnesses as to whether the man was clothed, but when police arrived he was fully empantsed. Nonetheless, the hortatory hobbyist was warned away from the building. 6:27 p.m. An iPod in a car is like the gooey nougat center of a delectable chunk of candy, one which proved irresistible to sweet-toothed slithy toves in the 1300 block of D Street. 8:02 p.m. A man ordered hot wings at a Plaza tavern/restaurant, glommed them down, then walked out without paying the $8.67. • Sunday, October 17 12:44 a.m. A he-she clash on Olympia Street resulted in him systematically trashing the trailer’s furnishings. 1:49 a.m. A drunk in Room 22 of a Valley West motel was having a drunken-good time yelling, singing and refusing to answer the door. Police arrived and found him exzonksted and unconscious. 3:10 a.m. A 15th Street resident’s porch light was like an on/off switch for a stranger who had been sleeping on the front porch. When the light was turned on, the tresnapper turned into a rock ’em-sock ’em robot, banging on the front door. As the resident called police, he lay down his weary, probably substance-addled head again. He’d left for a less strobey environment when an officer arrived. 9:42 a.m. Two men argued over breakfast on South G Street with sufficient fury to concern the surrounding populace. They agreed to simmer down. 9:44 a.m. A customer’s wallet was plucked from a shopping cart at a Valley West home of honest goodness, and by the next morning, an attempt to use the credit card was recorded. 11:36 a.m. Every Saturday afternoon around 2 p.m., vehicles swarm a Haeger Avenue residence, and numerous persons lugging large boxes come and go from the house through a side door carrying large boxes. The Drug Task Force was notified. 2:06 p.m. A medical patient became upset with customer service standards at a K Street marijuana store, creating a fuss. He was ejected on pain of trespass. 2:25 p.m. A driver on L.K. Wood Boulevard observed the car ahead of him repeatedly pull over and contact a teenage girl who was walking along the street. The 30ish man with long blond hair pulled over and summoned her to the car, but that didn’t work, so after a short distance he tried it again, this time asking “where to get lunch.” At this, the concerned driver behind him pulled over and rescued the damsel, she getting into his car instead. The good Samaritan then told the putative predator to get lunch downtown, duh. The license plate identified the driver as a non-HSU student. 4:28 p.m. Gas was siphoned from a car on Spruce Way. 5:06 p.m. A man was seen swaggering around with a sword on Granite Avenue. 5:27 p.m. A raccoon got stuck in a storm drain grate on Buttermilk Lane. But once people stopped poking it with sticks, it managed to wriggle free and get away. 9:15 p.m. How many morons does it take to sexually harass a supermarket manager in Uniontown? In this case, the bleating feebs totaled about six. Found in their silver mini-van, the rat pack was warned away. 9:23 p.m. A man in a black trench coat had a weird co-dependency with his dog at Ninth and H streets – it would bite him, then he’d kick it. Bite, kick, bite, kick and so on until they both wandered off. 9:58 p.m. A conscious, not alert and potentially combative man foamed at the mouth on Harpst Street. APD assisted UPD with the call. • Monday, October 18 1:36–1:43 a.m. A wallet and bicycle disappeared from the Plaza. 3:51 a.m. There was a certain poetic justice to the fate of a man caught peeing behind a building in the 1500 block of G Street. Someone who saw him urinizing the property whipped out a garden hose and sprayed him right back. The woeful, watered-down wee-wee wonder was pissed off in more ways than one and called police to complain. He was admonished and warned to keep himself and his personal hydrology crises off the property. 8:56 p.m. A dumpster fire, this one in an isolated garbage bin corral on Sixth Street. 9:10 p.m. Another dumpster inferno at Ninth and J streets. 11:27 p.m. Yet another fire, this one set in bags of sawdust placed against an L Street building. Extensive damage was averted by the building’s sprinkler system. • Tuesday, October 19 2:12 a.m. A man came to the police station saying that he had been shot in the head as a youth, and now he was hearing voices. He wasn’t armed and had no intention of harming himself, but was allowed to self-commit to a mental health facility. 7:31 a.m. A man gave a ride to a young woman from Redding who looked like she had been assaulted. She was penniless, so when he dropped her off at a Valley West restaurant, he gave her $20 and a sleeping bag. But he remained worried about her welfare and asked police to check in with her. 10:41 a.m. A man sat on the fence of a 13th Street home tending what was described as a can with a fire inside it. An officer found the man with a makeshift barbecue on the sidewalk being used to heat water, and moved him along. 3:22 p.m. A woman complained that people were “putting drugs into animals and that someone touched her dog and was mean to it.” It turned out to be the latest installment in a grudgy-wudgy fussbudgy episode in a serial snit which had previously occupied police time. 5:17 p.m. A perfect storm of inattentive pedestrians carrying fluids took place on I Street. Some combination of a woman and two men collided while walking, with some water being spilled. An argument ensued, water bottles were hurled and one antagonist deployed the ultimate weapon: soup. • Wednesday, October 20 10:01 a.m. A FedExed package of cannabis got as far as the Eighth Street ground facility before being intercepted. 12:20 p.m. A slithy tove hit the jackpot on Hallen Drive, trying a car door handle that opened up a vehicular treasure chest. Lost were a wallet containing $500, a cell phone charger and some kind of stereo cord. • Friday, October 22 2 a.m. A woman walked around on Fickle Hill Road, yamblathering loudly into her cell phone. A resident who asked her to speak more quietly received an even louder rebuke, and an argument ensued. 2:23 a.m. Another wee-hour confrontation with streetside loudies – eerily, on a similar-sounding street, Hilfiker Drive – was documented in more detail. A resident first complained of “extremely loud” basketball players outside. Before an officer could arrive, he rephoned to state that if police units didn’t get out there now he would “kill them.” At this point another neighbor appeared brandishing that most versatile problem-solving (or escalating) implement, a shovel. The next neighbor call queried police, “Are you going to get out here and save a life or what?” and then hung up. Officers, who had been occupied with sorting out multi-drunken dingbat imbroglios elsewhere, arrived 39 minutes after the initial call. They found no shovel casualties and a fully becalmed complainant. He said that after being threatened on his front porch by eight partygoers, he’d suggested that they go inside for the night and that they agreed. 11:31 a.m. A man came to the station complaining that two nights previous, a bouncer from one of the bars had confiscated his kitten in front of the donut shop. 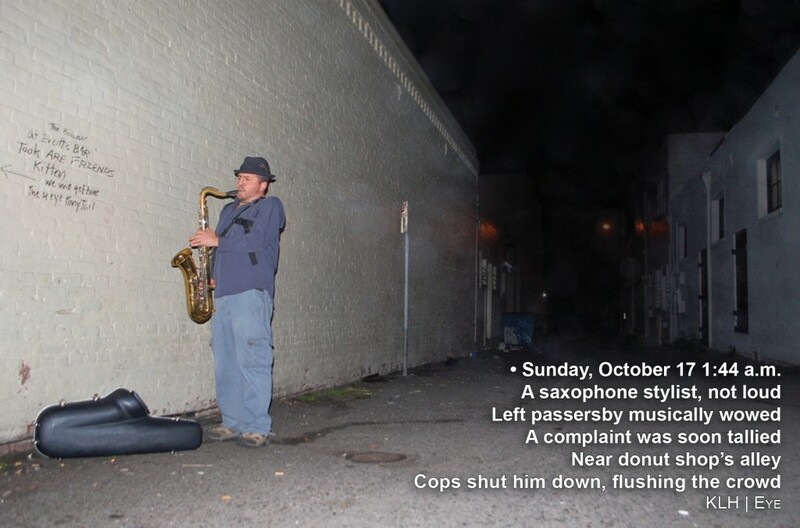 This entry was posted on Saturday, November 13th, 2010 at 6:06 am	and is filed under Community, Police Log. You can follow any responses to this entry through the RSS 2.0 feed.